The Turks & Caicos Aggressor II is a 120-foot hotel on the go that will take you to amazing sites throughout the islands that make up the Turks and Caicos, all while comfortably accommodating 20 passengers. 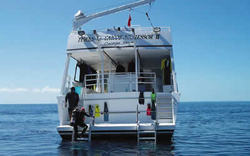 During the months of April through January, this comfortably equipped vessel will set off from Providenciales for a week of amazing wall diving along the coasts of West Caicos and French Caye. Between the months of February and March experience the majestic humpback whales as they migrate from the northern Atlantic. Scuba is not allowed with these giants, however you will be able to enter the water and snorkel with them. These charters depart from Puerto Plata Dominican. This yacht was designed with the diving enthusiast in mind, with truly unlimited diving (day and night). 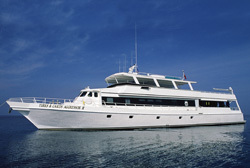 The Turks & Caicos Aggressor II charter is seven days (Saturday afternoon to Saturday morning), and includes five and a half days of diving. Most days on the beautiful blue Atlantic waters provide the opportunity to make 5 dives a day. * 1 Master Suite - Queen bed with private head and shower, hairdryer, TV/DVD, closet and port light. * 5 Deluxe Staterooms - Double berth and a single bunk with private head and shower, hairdryer, TV/DVD, closet and port light. 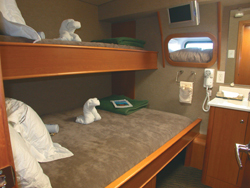 * 2 Twin staterooms - 2 single berths, closet, port light and TV/DVD. 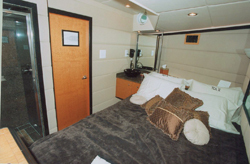 The two twin staterooms have an adjoining bathroom which is entered through each cabin. 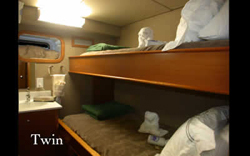 * 1 Quad cabin - 4 single berths (economically-priced), port light, shared lavatory/head/shower entered through the hallway. Humpback Whale Charters ** Feb. - Mar. there is a $200 add-on ** whale sanctuary taxes extra. Rates are per person in USD, double occupancy, except quads (pp quadruple occupancy), and are subject to change without notice. $200 discount applies to non-divers. $200 discount applies to consecutive charters. When multiple discounts apply, only the most generous offer can be applied to the charter rate. Inquire about earning free berths with group bookings. Custom designed itineraries available on whole boat charters.